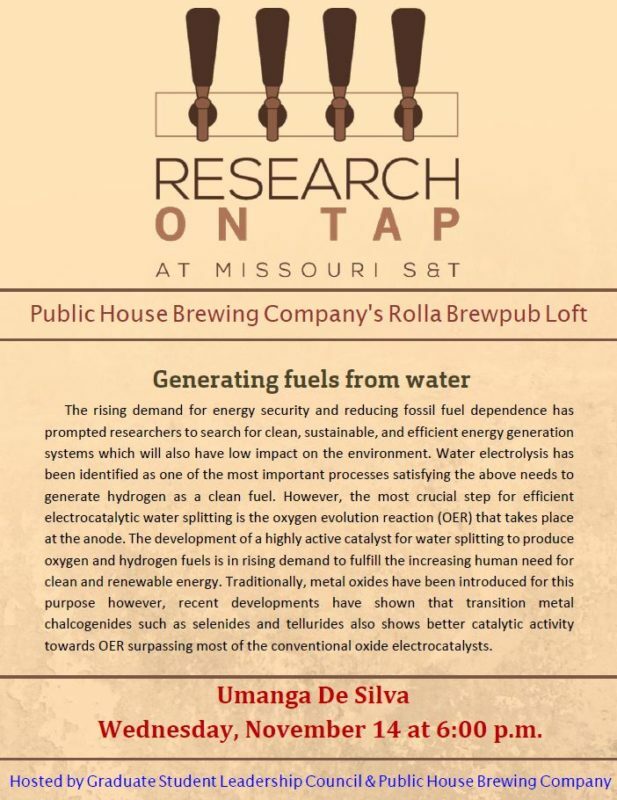 Research on Tap will be held at the Rolla location of Public House Brewing Company in the loft area Wednesday, November 14th at 6:00 pm. The rising demand for energy security and reducing fossil fuel dependence has prompted researchers to search for clean, sustainable, and efficient energy generation systems which will also have a low impact on the environment. Water electrolysis has been identified as one of the most important processes satisfying the above needs to generate hydrogen as a clean fuel. However, the most crucial step for efficient electrocatalytic water splitting is the oxygen evolution reaction (OER) that takes place at the anode. The development of a highly active catalyst for water splitting to produce oxygen and hydrogen fuels is in rising demand to fulfill the increasing human need for clean and renewable energy. Traditionally, metal oxides have been introduced for this purpose however, recent developments have shown that transition metal chalcogenides such as selenides and tellurides also shows better catalytic activity towards OER surpassing most of the conventional oxide electrocatalysts. Short Bio: Umanga de Silva grew up in Sri Lanka and completed her BS degree in chemistry from the University of Colombo and master’s degree in polymer technology from the University of Moratuwa in Sri Lanka. She is currently completing a Ph.D. degree in chemistry with a focus on electrocatalytic water oxidation in Dr. Manashi Nath research group. Her research interests include synthesis of nanostructured catalytic materials and understand the water oxidation capability of the catalysts through structure-property relationships.